which runs from 6/25 - 7/10. We put Charles Kowalski's Mind Virus to the test. 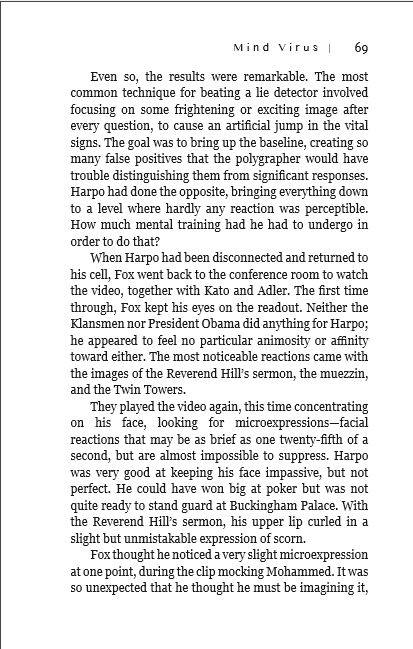 Robin Fox and his colleagues at the interagency HIG (High-Value Detainee Interrogation Group) are questioning a terror suspect, called “Harpo” because he hasn’t said a word since his arrest. Their polygraph team has just given him the Silent Response Test, asking him questions and showing a video meant to provoke strong emotional responses, while closely observing and recording his vital signs and facial expressions. Robin Fox, peace-loving professor of world religions, was once a decorated military interrogator, but he found the Bronze Star on his chest no compensation for the scar on his heart, and he has been striving ever since to make amends for his complicity in war crimes. But when an unidentifiable suspect tries to disperse a deadly virus in downtown Washington – the same one used in an attack on American forces in Iraq that Fox foiled – Fox is unwillingly drawn back into the shadowy world of intelligence. “Are you seeing what I’m seeing?” Fox asked. Charles Kowalski is almost as much a citizen of the world as his fictional character, Robin Fox, having lived abroad for over 15 years, visited over 30 countries, and studied over 10 languages. His unpublished debut novel, Mind Virus, won the Rocky Mountain Fiction Writers’ Colorado Gold Award and was a finalist for the Adventure Writers’ Competition, the Killer Nashville Claymore Award, and the Pacific Northwest Writers’ Association literary award. Charles currently divides his time between Japan, where he teaches English at a university, and his family home in Maine. Mind Virus is scheduled for publication by Literary Wanderlust on July 1, 2017. Other novels and short stories by Charles Kowalski: “Let This Cup Pass From Me”, “Arise, My Love”, “The Evil I Do Not Mean To Do”.